Experience delectable on-site dining from our collection of restaurants and in-room dining service. Fuel up with fresh, gourmet coffee or pastries at Starbucks or choose from a selection of cold drinks and ready-made snacks from our Grab-N-Go store. Enjoy watching the game over a cold beer or signature cocktail at Cricket’s Bar or enjoy delicious American cuisine at Marcelo's Bistro. Whatever your appetite, we’ve got you covered. Offering fresh pastries and all your favorite speciality coffee drinks, our on-site Starbucks in the main lobby daily is the ideal express start to a busy morning. 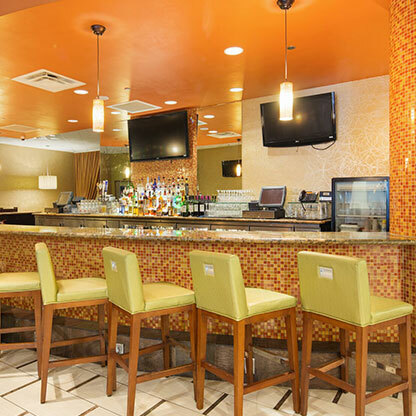 The ideal place to unwind after a long day of meetings or sightseeing, Cricket's Bar serves a tempting selection of appetizers and drink specials. Snag a comfortable bar stool, order a light bite and relax with a signature drink at Cricket's Bar while you catch up on your favorite sports on our large screen TV or sip your drink poolside on our sun-kissed sun-deck. Fuel up on all your traveler essentials and sightseeing snacks for action packed days of Orlando adventures. Choose from a selection of ready made sandwiches, snacks and drinks from our on site Grab-N-Go. 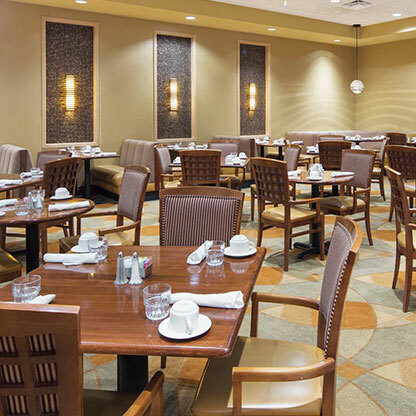 Enjoy a casual and comfortable dining atmosphere, at Marcelo's Bistro open for breakfast, lunch and dinner. Choose from a continental or gourmet breakfast buffet or order a hearty cooked breakfast off the menu. Enjoy lunch and dinner selections of mouth-watering American cuisine, from fresh salads to grilled steaks and seafood.